Salmon is one of nature’s healthiest foods, full of healthy fats, vitamins and minerals. 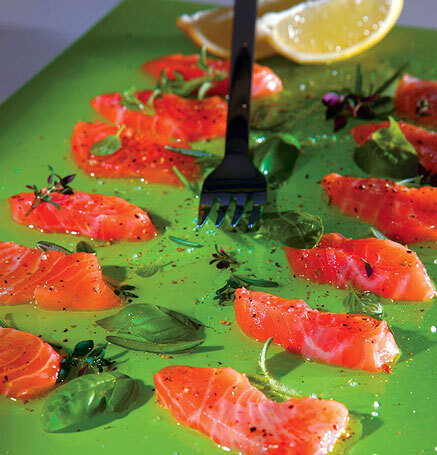 Marinated with olive oil and fresh herbs is used to tenderize the salmon and enhance the flavor. This is a simple way to serve finger food to friends. Remove skin and any bones that might be present from salmon and rinse off with cold water. Slice salmon very thinly with a sharp knife and arrange slices next to each other in a platter. Pour lemon juice and olive oil over fish, sprinkle with coarse salt and pepper and scatter herbs evenly on top. Allow salmon to marinate in refrigerator for 10’ and serve on top of blinis or on slices of dark bread which have been heated and brushed with olive oil.